In recent months there have been several inquiries about suspected cases of Shar-Pei Fever and a few cases where it was an important, yet overlooked differential. There seems to be mixed awareness among vets about this infrequent yet important disease. 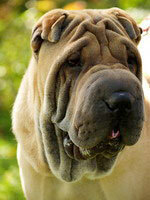 Shar-Pei Fever (FSF) is thought to be an inherited inflammatory disease characterized by episodic pyrexia. Lameness associated with Swollen Hock Syndrome (SHS) may also be present but not necessarily. The presenting signs are brought about by abnormal elevations in interleukin-6 (IL-6) resulting in dysregulation of the normal inflammatory pathways and this can ultimately lead to amyloid deposition in vital organs (especially kidney and liver). Cases can present at any age and usually have historical bouts of lethargy, irritability and anorexia that may well be due to episodic pyrexia, which often lasts a day and seemingly resolves without treatment. Other symptoms may include abdominal pain, reluctance to move, shallow breathing and sometimes mild vomiting/diarrhoea. SHS is only reported in about half of cases and is usually the result of cellulitis around the tibiotarsal joints rather than actual arthritis hence joint aspirates are often unremarkable. Histopathology of punch biopsies taken from periarticular skin can show immune complex vasculitis. Blood workup is usually unremarkable unless advanced disease associated with renal/hepatic amyloidosis is present. Urine specific gravity readings of 1.010 - 1.022 or proteinuria may support early renal involvement. Concurrent hypoalbuminaemia and hypercholesterolaemia would suggest advanced disease associated with nephrotic syndrome. Other tests including radiography, blood culture, Borrelia antibodies (Lyme's disease) and anti-nuclear antibodies are usually unremarkable. A history of unexplained weight loss, polyuria/polydipsia, vomiting, uraemic breath or findings of icterus, hepatomegaly or haemabdomen (secondary to hepatic rupture) should all prompt consideration of amyloidosis secondary to FSF. The severity and frequency of episodes of fever/lameness do not correlate well with the degree of amyloidosis and more importantly amyloidosis may be present with no evidence of fever or lameness. There is no single diagnostic test available for FSF and the wide variation in clinical presentations, with often little evidence of clinical pathology, makes definitive diagnosis difficult; however, a wider awareness of the existence of this disease may one day help in developing a suitable diagnostic test.